After the two and a half uninterrupted hours of the Ring’s prologue, Das Rheingold, Die Walküre returns to Wagner’s standard three act format. The number of principals shrinks to just six (plus eight Valkyries) and the opera demands typical Wagnerian stamina from Brünnhilde and Wotan in particular. Die Walküre is by far the most approachable of the four Ring operas, and is the only one to be regularly performed as a standalone opera. The story is self-contained and the music is some of the most memorable and stirring of the entire cycle. In Act 1 Siegmund and Sieglinde, twins fathered by Wotan, meet and fall in love, despite being menaced by Sieglinde’s husband, Hunding. Fricka, goddess of marriage, reminds Wotan in Act 2 that Siegmund must pay for violating the sanctity of marriage and Wotan reluctantly instructs Brünnhilde to prevent Siegmund winning a duel with Hunding. After meeting Siegmund however, Brünnhilde rebels and tries to help him. In the midst of the duel, Wotan appears, breaks Siegmund’s sword (which he himself left for Siegmund in Hunding’s home) and allows him to be killed. Brünnhilde flees Wotan’s wrath but the god catches up with her in Act 3. Brünnhilde’s punishment is to sleep on a rock surrounded by magic fire, where she will wait for a hero to rescue her. The superstar of this performance is clearly Birgit Nilsson. She had sung the role of Brünnhilde a couple of times at the Met in 1960, as well as at Bayreuth, but this is the first time the broadcast audience would hear her in the complete cycle. For those familiar with her Isolde and Turandot, her Brünnhilde is everything a Wagnerian would want. Her entrance in Act 2 is one of the most famous in all opera, and also perhaps the most daunting, with her battle cries demanding top Bs and Cs, both short and sustained. The audience can gauge how good their Brünnhilde is going to be within seconds of her first notes. There have been many great Brünnhildes but none quite like Nilsson. Her high notes can only be described as ‘laser-like’, easily soaring above the orchestra to the very back of the auditorium. The sheer freedom of her voice as she unleashes it is magnificent. Her Brünnhilde is clearly a warrior maiden to be reckoned with. Otto Edelmann is an experienced Wotan. The Austrian bass was particularly well known for his portrayal of Hans Sachs in Die Meistersinger von Nürnberg, a role he had sung at the first post-war Bayreuth festival, and brought to the Met in 1954. 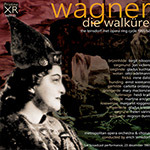 His artistry is widely preserved in broadcast recordings, as well as a famous Act 3 of Die Walküre recorded for Decca in 1957 with Kirsten Flagstad as Brünnhilde and Georg Solti conducting, often seen as a test-run for the complete Decca ring. Canadian Jon Vickers, singing Siegmund, had a lengthy international career encompassing some of the most demanding tenor roles. His manly, forthright, tone was ideally suited to Otello, Peter Grimes, Aeneas, Don José, and Parsifal. Later in his career he successfully added the role of Tristan. As a heroic tenor who kept one foot firmly in the Italian/French repertoire, Vickers gives us a Siegmund who can sing with both a touching tenderness and ringing declamation. Sieglinde is sung by American Gladys Kuchta. The bulk of Kuchta’s career was in Europe, particularly in Germany, and she features in only three Met broadcasts (two of which formed part of this Ring Cycle). Although a versatile soprano, her large voice inevitably led her into the heavier roles of Wagner and Strauss such as Brünnhilde, Isolde, Elektra and the Dyer’s Wife. Kuchta captures the femininity of Sieglinde very nicely, while being well able to match Vickers in the more dramatic moments. Like Kuchta, Ernst Wiemann spent most of his career in his native Germany, mainly in Hamburg, but at the Met he sang many of the major Wagnerian bass roles such as Daland, Pogner, and King Henry. He sings Hunding with appropriate malevolence and he is also the Fafner in Das Rheingold in this broadcast cycle (PACO152). Irene Dalis is the only other principal to remain from the first opera in the cycle, reprising her role as Fricka. The reviewer in Musical America commented ‘Miss Dalis was so beautiful a Fricka that it was hard to understand Wotan's notorious infidelities.’ Her short scene with Wotan confirms her as one of the leading mezzo-sopranos of her generation. Conductor Erich Leinsdorf insisted that the traditional Met cuts made in Acts 2 and 3 of Die Walküre be restored. Parts of Wotan’s Act 2 monologue and the Brünnhilde/Wotan scene in Act 3 were the usual sacrifices, though they varied slightly in length according to the preference of the conductor. This broadcast is the first time the radio audience had heard the complete score since Leinsdorf’s first broadcast in 1940 (PACO125).